I've had a great week of rocking beats and thunderous bass in my home office, thanks to AT&T St. Louis and the "Beatbox", the latest music playing device that "Beats By Dr. Dre" produces. I haven't had this much portable enjoyment since the days of the tape deck boom boxes. Way back in 1984, my brother and I saved our money and pooled our resources to buy a Jensen dual tape deck portable boom box that ran on 8 D-cell batteries. It created an instant party wherever we went. Portable music players stayed popular for the next 10 years but seemed to tail off in popularity by the year 2000. I haven't owned a portable unit myself in at least 10 years. The thought hadn't even crossed my mind. But after streaming music from my iPhone 3GS to the Beatbox by Dr. Dre's Beats Audio, I'm ready to pack a portable pounding music box again. 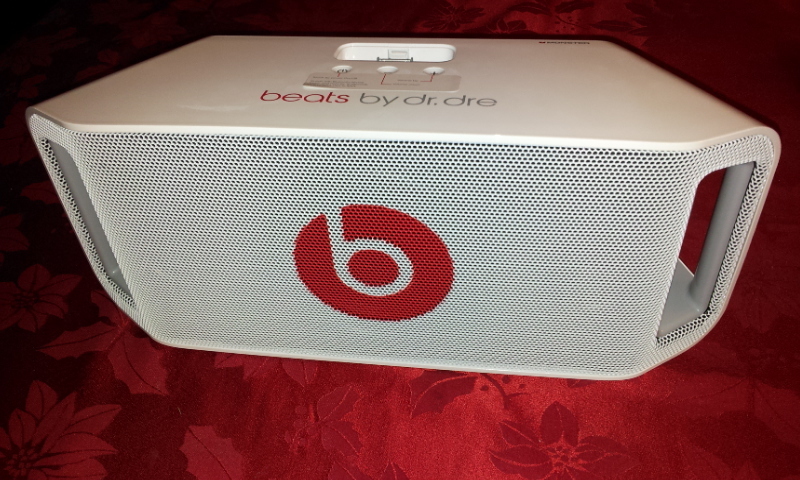 What I love about the Beatbox is the audio quality, and the cleanness and strength of the bass. I don't ever remember getting such a rich, deep, booming bass response out of an equally-sized device. You will get distortion if you crank the volume to ten, but the bass is clean and full when the volume is reasonably set. Mids and highs are super crisp and clean, and you almost forget you're listening to a portable music device after it has been on for a few song selections. After buying a good pair of Altec Lansing speakers and a subwoofer for my home computer, I have never been able to listen to music from portables. But the Beatbox is the first to raise the bar high enough that it creates acceptable sound. The only brand that I can seriously compare this unit to would be Bose. Bose has mastered the huge-sound-from-a-small-device design skill, and the Beatbox gets the head-nod of approval to be placed on that same pedalstal for making micro musical magic. You can stream music to the Beatbox from your smartphone via bluetooth, OR you can dock your iPod Touch or iPhone on the top of the unit and it will automatically pick it up. You have 3 touch buttons on top of the device, and they also interact with your iDevice while docked. The price tag reflects the quality, at $449 retail. But this is no cheap bottom-shelf Radio Shack portable tape player. This is an audiophile's portable dream. If portablitly, high sound quality, and bluetooth streaming simplicity is what you seek, I recommend the Beatbox. Check out the video below for my live review!